John Warner (left) of the Darke County Chamber of Commerce presents Ohio Auditor Keith Faber with gifts from the chamber following its 12th annual Groundhog Day event on Friday at Romer’s Catering in Greenville. 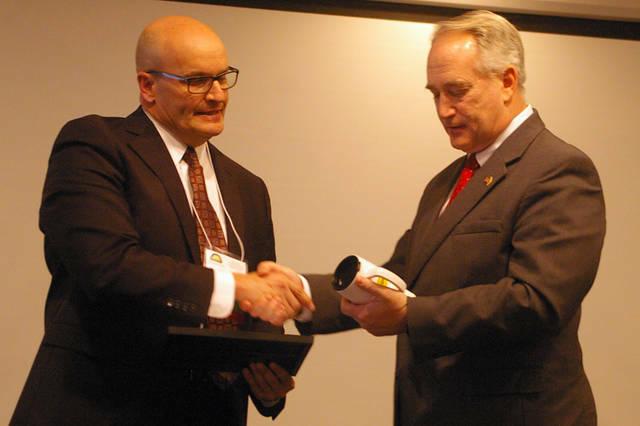 GREENVILLE – Keith Faber, who was sworn in as Ohio auditor in January, is pushing local and state officials to accept initiatives he said will save Ohio taxpayers money. Faber was the headline speaker at the Darke County Chamber of Commerce’s 12th annual Groundhog Day Event on Friday at Romer’s Catering in Greenville where he spoke to business leaders about proposals he’s pushing across the state. The Auditor’s Office audits all public offices in Ohio, which includes almost 6,000 organizations. The office’s mandate is to help agencies save money and prosecute individuals who commit fraud with taxpayer money. Faber is pushing the state legislature to adopt new regulations he said will help the Auditor’s Office in its mission. “The big thing is we need help from the legislature, one, to make our tools available to more local governments, and two, to help give us some authority to go in and do more of what we’ve shown has a good rate of return on investment for Ohio taxpayers,” Faber said. The Auditor’s Office is authorized to conduct one higher education performance audit a year. A small scale audit of The Ohio State University’s information technology and printing services alone found approximately $6 million in savings, Faber said. By allowing the Auditor’s Office to undertake more higher education performance audits, colleges could make education more affordable by making them more efficient, Faber said. Faber also wants the legislature to create a fund to help schools, cities, villages and townships pay for performance audits. The state currently completes about 15 performance audits a year, Faber said, and a dedicated fund could spur more public officials to push for cost-saving audits. “We want an increase in the shared partnership between the state and the locals, to have the state pick up some of those audit expenses, because, candidly, it’s things that are going to benefit all Ohioans,” Faber said. The rate is return on performance audits is $22 for every dollar spent, Faber said. By identifying cost-saving measures, he thinks the extra work could save money for taxpayers. Faber, a former state representative and senator from Celina, said Friday’s appearance at the Darke County Chamber of Commerce event was his first back in his former district since assuming the auditor position. He said he’s excited about the position because he views it as the one executive office in the state that can change the way government works. This entry was tagged Auditor, Chamber of Commerce, Darke County Chamber of Commerce, Keith Faber. Bookmark the permalink.